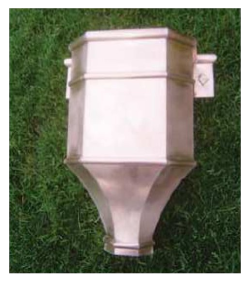 Architectural appeal is the most common purpose for the use of Conductor Heads, also known as Collector Boxes, Leader Heads, and Scupper Boxes. Conductor Heads add the finishing touch to a well installed gutter system. 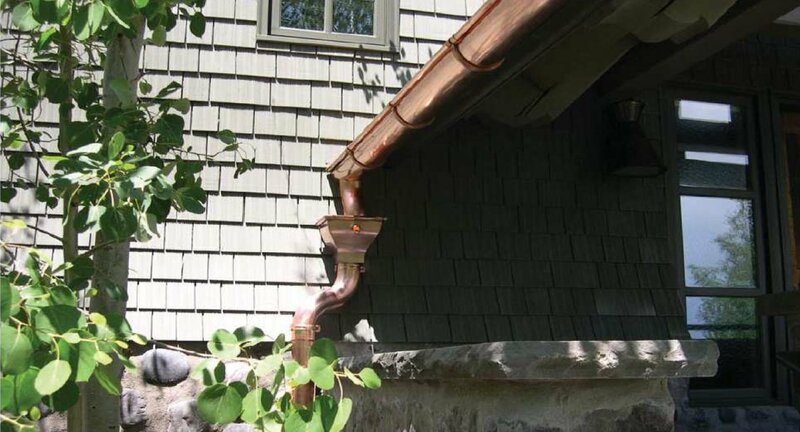 “If somebody’s going to spend $10,000 or $20,000 on copper gutters, then for a just a little more they should get the complete ‘look’ of a classic gutter system by installing leader heads as well,” believes Sock Woodruff, owner of RainTradeCorporation (www.GutterSupply.com), a gutter supply company based in Lake Bluff, Ill. In addition to their ornamental appeal, he points out that leader heads “function as an overflow for water and ice build up, and in long runs they also allow air into the conductor to prevent vacuum and keep the water flowing effectively. RainTrade offers 25 styles of leader heads whose names — from Abbey to Yorkshire — suggest the product’s historic European origins, though Woodruff says a few manufacturers may offer a streamlined modernist look. “They’re usually made of 16-ounce copper,” he continues, “and used for upscale custom homes, churches, and public buildings. His company has patterns and jigs from which its in-house craftsmen can then make custom leaderheads by hand, soldering the various components together. Woodruff puts the cost of the products at $300 and up, “though the price could double or triple if the homeowner wants a custom-made style. "One strategy to keep down costs, he adds, is to install leader heads only on the front of the House. “But really,” he points out, “they don’t cost all that much when compared to the total price of the house, or even the gutter system." Leader heads are easily mounted on brick or stone using mortar plugs, Woodruff explains, or on wood using stainless steel screws. “With the growth of copper gutter sales over the past five years, sales of leader heads have increased along with that,” he adds. “Though they’re often specified by architects, I’ve also seen gutter installers use them as an up-sell item." 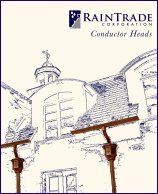 In its catalogue RainTrade refers to the products as conductor heads, while others prefer to call them collector boxes. “They’re more of an upscale item. Functionally, leaderheads can improve the flow of water. Some have overflow spouts that can indicate an obstruction. But people really buy leader heads for their decorative value.” adds Gene Stucky, a distributor of Italian leader heads. Products can be made from zinc, aluminum, or steel, but Stucky agrees copper is the most common choice. 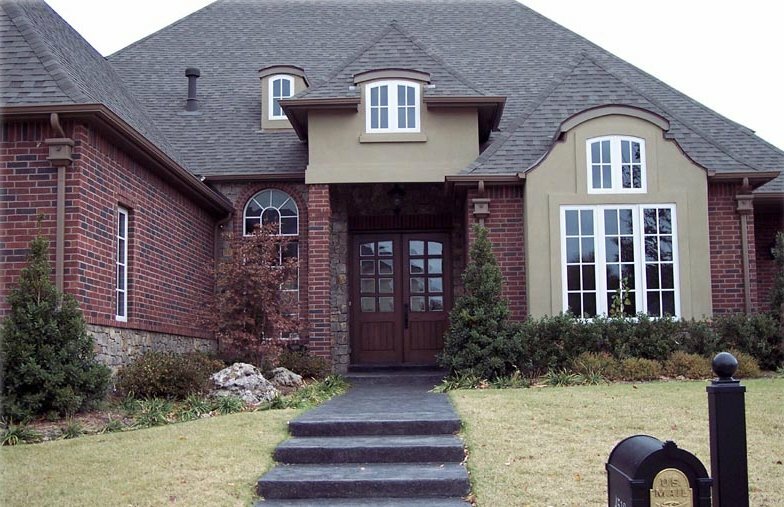 Across the industry, he reports prices can range from $100 up to several hundred dollars or even more.“If you’re going to have an upscale gutter system,” Stucky says, “then you don’t want it to be unaccessorized. Leader heads are accent pieces. Though they’re popular with European-style homes, leader heads also fit well with Southwestern adobe style — which is somewhat Mediterranean — and with mountain rustic styles and log homes. 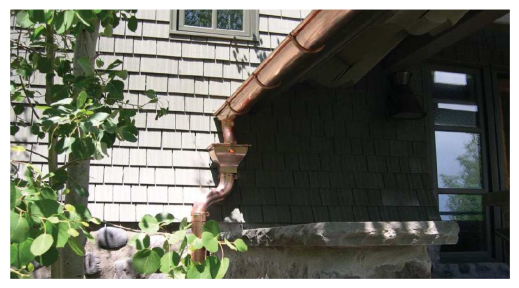 Even if copper prices have seen big increases in recent years, Stucky reports these hikes have yet to make a dent in sales of copper gutter systems. “Homeowners who install leader heads are an upscale clientele who are less affected by price increases or by a slowdown in the housing market,” he observes. 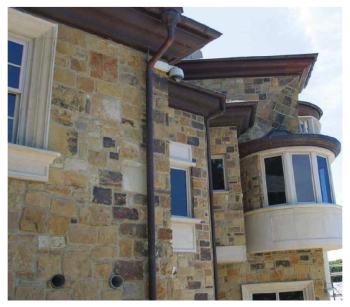 “Architects will often specify leader heads, but many gutter installers also sell them as well. 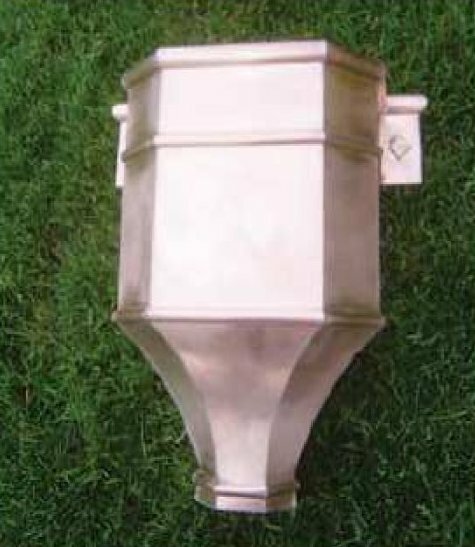 At Metal Tech-USA of Peachtree City, Ga., the products are called hopper heads. Marketing manager Shane Norris explains the company distributes products both from Revere Copper and from RHEINZINK. He pegs the price of zinc leader heads at around $100, “which is more than aluminum but less than copper, so that you can get an affordable alternative to copper that still provides you a great European look. 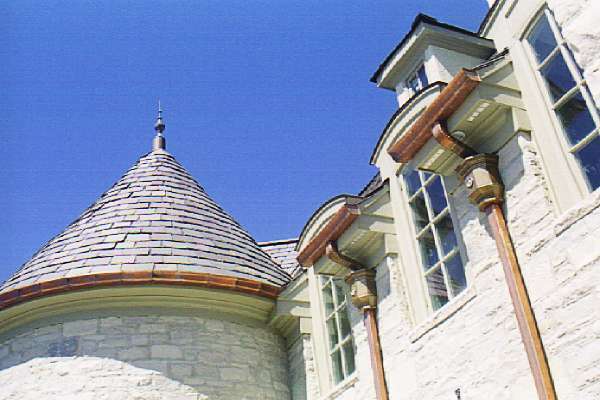 Other customers for zinc gutter products can include museums, libraries, college dorms, and other institutional buildings where a clean but aesthetically appealing look is preferred. 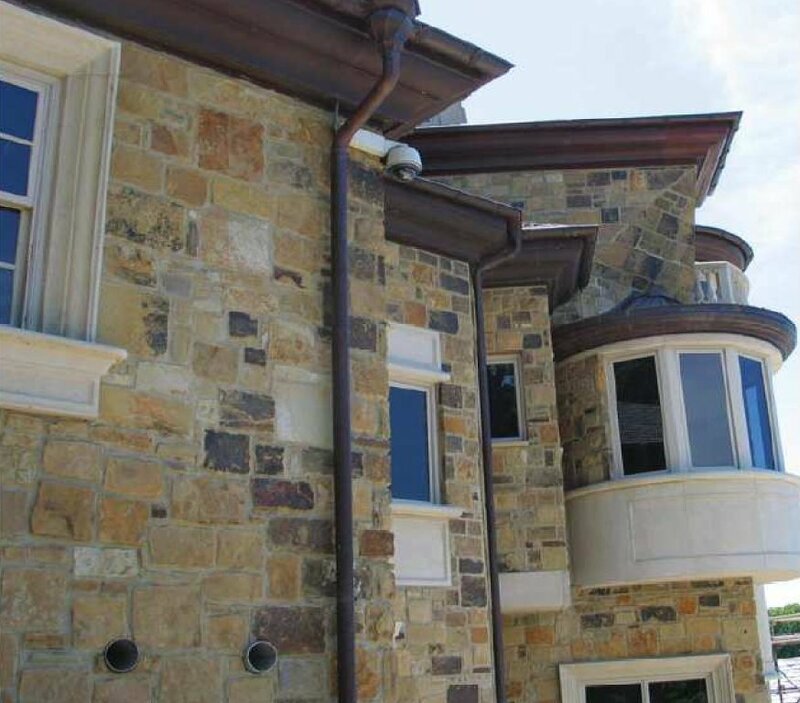 For homeowners who invest in an upscale gutter system, Norris advises, “Leader heads are like the cherry on top of the sundae, or the icing on top of the cake. That makes them great upsell items for contractors. Homeowners don’t usually get excited about gutters. But when we show them some leader heads, people brighten up and say, ‘That’ll look great on my house! Another company out of Northbrook, Ill., offers several standard leader heads designs but specialize in historical reproductions. The favored terminology at the company is to call the products conductor heads. But by whatever name, its craftsmen can custom-fabricate the items in copper, lead coat, Kynar-painted aluminum, and Kynarpainted, galvanized, or stainless steel. Standard-design copper leader heads start at about $180, while large custom-made units can top $1,000 each. “The market is highend, churches, public buildings, and universities,” relates marketing director Ryan Hill. “And our sales are probably split about 50/50 between residential and nonresidential applications. As Hill sees it, people who view leader heads as “extras” are homeowners who are stuck with copper gutters, no matter what. “If you’ve got a cedar roof, ”he explains, “then you’ve got to use copper gutters, since copper doesn’t cor-rode from tannic acid. 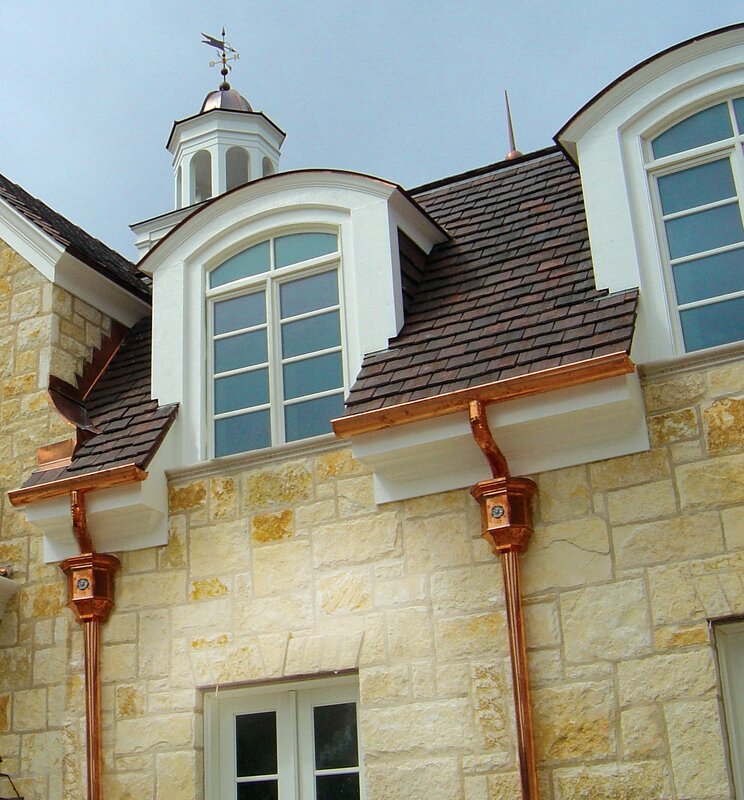 So if you have no choice, maybe your goal is just to keep your costs down.” But when homeowners make a conscious choice for copper gutters, leader heads are more likely to be part of the package. One company that does prefer to use the term leader heads (one word, not two) is out of Decatur, Ala. The firm’s managing partner, Guenther Huber, is an immigrant craftsman whose family has been making leader heads and fabricating decorative architectural metal products in Germany for two centuries. “About 80 to 90 percent of the leader heads installed in the United States are just decorative and functionally useless, ”Huber states. Nevertheless, leader heads typically sell for between $150 and $600, he has crafted custom-made leader heads for as much as $2,500 each. “And in that case, ”he smiles, “the homeowner ordered 20 of them!” In another case, he once made leader heads that also incorporated gaslights in the design. Not surprisingly, the primary markets for Huber’s leader heads are multimillion-dollar homes, historic renovations, churches,and institutions. Yet even though architects often specify the items, he has also seen many cases where installers are able to sell their customers on adding leader heads to a gutter project. Leader Heads - That Extra Touch!